This post will guide you how to use Excel MONTH function with syntax and examples in Microsoft excel. 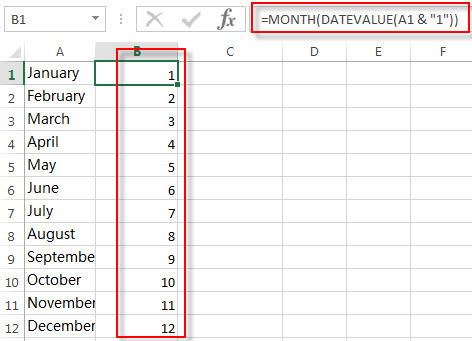 The Excel MONTH function returns the month of a date represented by a serial number. And the month is an integer number from 1 to 12. And you can use the MONTH function to get a month component from a given date value. And you can feed the month number to another formula. The MONTH function is a build-in function in Microsoft Excel and it is categorized as a DATE and TIME Function. The MONTH function is available in Excel 2016, Excel 2013, Excel 2010, Excel 2007, Excel 2003, Excel XP, Excel 2000, Excel 2011 for Mac. Serial_number -This is a required argument. A valid date value that contains the month component you want to extract. Dates should be entered by using the DATE function, or as results of other formulas or functions. For example, use DATE (2019,3,15) for the 15th day of March, 2019. If the serial_number is not a valid Excel date, it will return #VALUE! Error. 1# get month of the date in Cell A1, enter the following formula in Cell B1. 2# convert Month name to number, type the following formula in Cell B1. You should use the DATEVALUE function to convert a date stored as text to a serial number. Then feed the result into the MONTH function to extract a month number from date. You can create a formula based on the SUMPRODUCT function and the YEAR function to count dates by a give year….